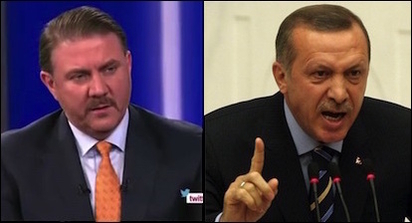 In a remarkable display of paranoia, Yigit Bulut (left), a top advisor to Turkish President Recep Tayyip Erdogan (right), recently accused foreign chefs on cooking programs shown on Turkish TV of being spies. Turkish President Recep Tayyip Erdogan has good reasons to be living in constant fear. Only a few months ago, on July 15, hundreds of military officers, including several in his own security detail, attempted to topple him in a coup d'état. But the way he thinks he can best fight and win a future attempt at his governance -- and life -- exposes Turkey to the risk of civil war. Erdogan's fight against coup-plotters is legitimate. His paranoia is understandable. But his efforts to build a private army of devotees is not. The level of paranoia surrounding his 1,100-plus-room palace is reaching new heights. One of his chief advisors, Yigit Bulut, recently accused foreign chefs on cooking programs shown on Turkish TV stations of being foreign spies. Bulut claimed that foreign chefs are touring Anatolia merely to gather intelligence and are collecting information about military bases and industrial facilities in Turkey. Bulut may sound amusing, but he is one of Erdogan's chief advisors. The establishment of this unit tells us that Turkish adventurism is not to be quelled any time soon. To the contrary, it will expand because now we see the government is willing to spare more funding and human resources to special operations. The institutionalization also tells us that Turkish presence in Syria and involvement in Iraq will be coordinated from this center and that this unit is set to grow in the coming months. There are also signs that Erdogan wants to fight an all-out war inside Turkey against any and every enemy he may be facing. In August, Erdogan appointed retired general Adnan Tanriverdi as one of his chief advisors. Tanriverdi is the owner of Sadat, an international defense consultancy company. Sadat defines its mission as "providing consultancy and military training services at the international defense and interior security sector." Critics, including opposition lawmakers, are inquiring about Sadat's activities, suspecting its real mission may be to train official or unofficial paramilitary forces to fight Erdogan's multitude of wars inside and outside Turkey. "Inside" will mean fighting future dissidents and "outside" most probably means training jihadists fighting Erdogan's sectarian wars in countries such as Syria. Erdogan probably fears Shia expansionism more than Kurdish adventurism, but most likely in his thinking, Kurdish adventurism is part of Shia expansionism. As if all of that is not enough to risk peace by means of an unofficial army in the making, Erdogan recently took another step to enforce his defense against real and fictional enemies. In October, Turkey's religious affairs general directorate, or "Diyanet," issued a circular for the formation of "youth branches" to be associated with the country's tens of thousands of mosques. Initially, the youth branches will be formed in 1,500 mosques. But under the plan, 20,000 mosques will have youth branches by 2021, and finally 45,000 mosques will have them. Observers fear the youth branches may turn into Erdogan's "mosque militia," like the Nazi Party's Hitler Youth organization in Germany. Having youth branches for mosques is a dangerous idea, especially for a country such as Turkey, where societal divisions along secular and conservative Muslims lines are deeply polarized and risk violence. The mosque militia may provoke a secularist reply in the shape of "secular youth branches." Then it will be anyone's guess where and when the first spark of violence will commence. Erdogan commands NATO's second-largest army and a huge security and intelligence organization. He does not need to build an army of pious youths to provide him personal security. This will only lead to potential violence, and in the worst-case scenario, to a civil war. He should drop the idea of a private army of pious young Sunni Muslims before it will be too late.